I don’t know if any of you saw this mediocre movie called I Am Sam, but there is a scene where Sean Penn, who plays a mentally challenged father who loses his beloved daughter to the courts, literally walls himself in his apartment with origami bricks. I only bring this up because the origami bricks from this film were really flimsy, and looked like a paper curtain. If Sean Penn’s character Sam wanted to build a better and firmer wall, he could have used Bloxes. What exactly are Bloxes? 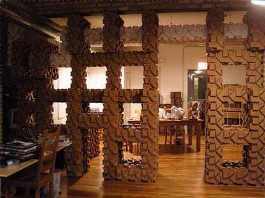 Well, they are building blocks make from interlocking pieces of folded-up corrugated cardboard. As you can see from this picture, you can connect them together on all six sides and make walls, benches, tables, or pretty much anything else. You can really create a unique look that unfortunately won’t be fireproof. These Bloxes may sound a bit like a plastic toy that rhymes with Eggo, but these Bloxes aren’t designed with children in mind. In fact, the website recommends getting a group of people together, and, after some beer and pizza, have a Bloxing assembling party. Once the Bloxes are assembled, they are quite large at 9 ½ inches square. Put twenty of these Bloxes together and you can create a 4-by-5 wall of 36 by 45 inches. You can get Bloxes directly from the website in colors of White or Brown for about $59.95 a pop. You say the lack of fireproofing like it’s a bad thing?